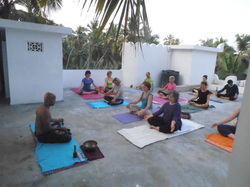 You don't have to pre-arrange your yoga classes, when you come to Kovalam. There are plenty of courses offered all season long open for drop ins. Here is a list of some, but certainly not of all centers and teachers available. You can also find your personal yoga teacher and take your lessons right at Muringa Vila.